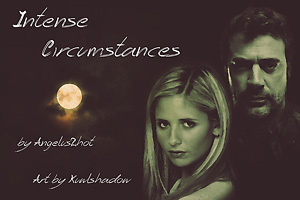 Artist notes: Been awhile since I did some BTVS artwork and nekid_spike is having their first own minibang! Of course I had to participate! I selected two stories to do artwork for and what is even cooler is that it is a crossover with Supernatural. Angelus2hot wrote an awesome story which I hope you take the time to read. Thanks to nekid_spike for this opportunity. Background photo credit goes to Moon-Willowstock.